McIntosh Gallery, Secret Stash: Accumulation, Hoarding and the Love of Stuff, London ON, 2013. Curator: Kirsty Robertson. Maison de la culture du Plateau Mont-Royal, L'Odyssée d'Espace, Montreal, 2012. Participants: Roland Poulin, Pierre Ayot, Simon Bilodeau, Raphaëlle de Groot. Curator: Serge Fisette & Nicolas Mavrikakis. Art Labor 2.0, 'By Sea, Land, and Air We Prosper', Shanghai, 2011. Participants: Arabella Campbell, Douglas Coupland, Brendan Tang, Kevin Schmidt. Curator: Ian Verchere. Centre A, CO-LAB, Vancouver, 2011. Participants: with Gillian Jerome. Curator: Debra Zhou. Pump House Gallery, Smoke, London, UK, Oct-Dec 2008. Curator: Implacasphere. Walter Phillips Gallery, Bureau de Change, Banff, AB, Jul-Dec 2008. Curator: Helga Pakasaar & Sylvie Gilbert. Agnes Etherington Art Centre, Conversation Pieces, Kingston, ON, Jan-Feb 2008. Participants: Linda Duvall, Germaine Koh, Deirdre Logue, Matt Rogalsky, Laurel Woodcock. Curator: Sarah E. K. Smith. Kenderdine Art Gallery, Me & Them, Saskatoon, SK, Sep-Nov 2007. Participants: Eric Cameron, Ian Carr-Harris, Gerald Ferguson, Brian Groombridge, Germaine Koh, Kelly Mark, Jocelyne Prince, Jeannie Thib. Curator: Micah Lexier. University of Lethbridge Art Gallery, Collecting Collecting, Lethbridge, AB, Jun-Sep 2007. Part of "Collecting Everyday" exhibition series. Curator: Josephine Mills. Plug In ICA, Unlearn, Winnipeg, MB, Sep-Nov 2006. Participants: Marina Abramovic, Marc Bijl, Paul Butler, Minerva Cuevas, Michel de Broin, JODI.org, Germaine Koh, Alexander Kosolapov, Ken Lum, Kelly Mark, Johannes Wohnseifer. Curator: Steven Matijico. Inter/Access, The Networked City, Toronto, ON, May-Jun 2006. Temporary public art projects. 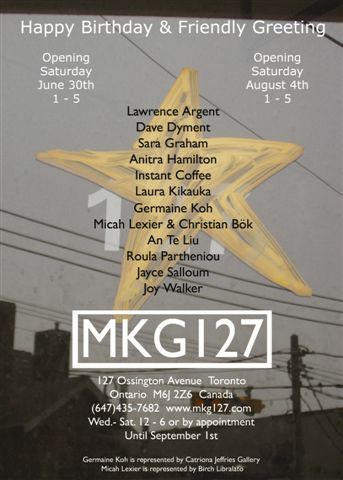 Participants: [murmur], Paulette Phillips, Marla Hlady, Luis Jacob, Amos Latteier, Germaine Koh. Catriona Jeffries Gallery, 274 East 1st, Vancouver, BC, 2006. Participants: Christos Dikeakos, Geoffrey Farmer, Arni Haraldsson, Brian Jungen, Roy Kiyooka, Germaine Koh, Myfanwy MacLeod, Damian Moppett, Alex Morrison, Jerry Pethick, Isabelle Pauwels, Judy Radul, Kevin Schmidt, Ron Terada, Ian Wallace, Jin-me Yoon. Museum Het Valkhof and Paraplufabriek, Hidden Rhythms, Nijmegen, NL, Dec 2005-Jan 2006. Curator: Hilde de Bruijn. Martin Gropius Bau, Urbane Realitäten: Fokus Istanbul / Urban Realities – Focus Instanbul, Berlin, Jul-Oct 2005. Curator: Christoph Tannert. Confederation Centre for the Arts, Curb Appeal, Charlottetown, PEI, May-Oct 2005. Curator: Shauna McCabe. De Appel, Radiodays, Amsterdam, Apr 2005. Curator: De Appel Curatorial Training Program (Rael Artel, Huib van der Werf, Kathrin Jentjens, Claire Staebler, Jelena Vesic, Veronica Wiman). SF Camerawork, Monument Recall: Public Memory and Public Spaces, San Francisco, CA, Oct-Nov 2004. Curator: Paula Levine, Laurie Blavin & Trena Noval. Open Space, (self)Publish or Perish: Books, Zines, Comics, Postcards, Pamphlets & Manifestos, Victoria, BC, Feb-Mar 2004. Curator: Jo Cook. Kitchener-Waterloo Art Gallery, faceLIFT, Kitchener, ON, 2004. Curator: Allan Mackay. ZieherSmith Gallery, Important Canadian Art, New York, 2004. Seoul Museum of Art, MosaiCanada: Sign & Sound, Seoul, Sep-Oct 2003. Curator: Wayne Baerwaldt, Nancy Campbell & Keunhye Lim. 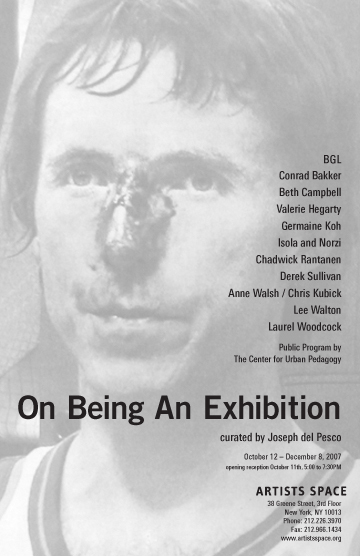 Bloomberg SPACE, Our Mutual Friend, London, UK, Feb-Mar 2003. Curator: Sacha Craddock et al. Catriona Jeffries Gallery, I Sell Security, Vancouver, BC, Summer 2003. Glowlab, PsyGeoConflux, New York, 2003. Bellevue Arts Museum, IN THROUGH THE OUT DOOR, Seattle, WA, 2003. Touring exhibition organized by The Power Plant (Toronto). Curator: Xandra Eden. Gallery TPW, The Found and the Familiar, Toronto, ON, Oct-Nov 2002. touring 2003-04 to Confederation Centre Art Gallery, Gallery Connexion, Art Gallery of Bishop's University Curator: Sophie Hackett & Jennifer Long. Latitude 53, Visualeyez performance festival, Edmonton, AB, 6-9 Aug 2001. Curator: Todd Janes. La Centrale, Le mois de la performance, Montreal, QC, 1-6 Dec 2000. Art Gallery of Windsor off-site, Tracking, Windsor, ON, Nov-Dec 2000. Curator: Helga Pakasaar. Blackwood Gallery, Logo City, Mississauga, ON, May-Oct 2000. Curator: Barbara Fischer. Frances Lehman Loeb Art Center - Vassar College , Making Light: Wit and Humor in Photography, Poughkeepsie, NY, Apr-Jun 2000. Curator: Joel Smith. Catriona Jeffries Gallery, Self-conscious, Vancouver, BC, Mar-Apr 2000. Participants: Geoffrey Farmer, Germaine Koh, Damian Moppett, Kelly Wood. Curator: Melanie O'Brian & Kyla Mallett. W139, The Global 500 , Amsterdam, Sep-Oct 1999. Part of 17th World Wide Video Festival. Curator: Jean Bernard Koeman. Optica, 1000 gracias, Montreal, QC, 1999. Participants: Lucy Pullen, Germaine Koh. Curator: François Dion & Luis Jacob. Wiensowski & Harbord, Imitating Christmas, Berlin, Dec 1998-Jan 1999. Curator: Jens Hoffmann. Art Gallery of Greater Victoria, London Life Young Contemporaries '96, Victoria, BC, 1998. Touring from London Regional Art and Historical Museums. Curator: James Patten. London Regional Art and Historical Museums (now Museum London), London Life Young Contemporaries '96, London, ON, Sep-Oct 1996. Touring 1998 to Art Gallery of Greater Victoria. Curator: James Patten. Inter/Access, Asian Heritage Month, Toronto, ON, May-Jun 1996. Participants: Eric Fong. Curator: Yam Lau. Franklin Furnace, The Rite of Spring, New York, Apr-Jun 1996. Participants: Roberly Bell, Alejandro Berlin, Craig Bruns, Gudrun Freder, Juan Perdiguero, Jess von der Ahe. Scotland Street Museum, Fairytale in the Supermarket, Glasgow, Oct-Nov 1995. Part of "Fotofeis 95 International Festival of Photography in Scotland". Curator: Judith Findlay & Kirsty Ogg. Artcite, Velvet Fever and Other Kitsch Inclinations, Windsor, ON, Jun-Jul 1995. Participants: Karl Apple, Michael Buckland, Sadko Hadzihasanovic, Alison Kendall, John Latour, Fancesca Maniaci, Chris Saruk Reid, Alex Skakoon. Special jurors: Suzanne Konyha and Allen Bukoff. Or Gallery, Group exhibition, Vancouver, BC, Apr-May 1995. Curator: Janis Bowley. University of Toronto Scarborough, Connections, Toronto, ON, Feb-Mar 1995. Participants: Catherine Heard, Germaine Koh, Anita Mitra. Curator: Liz Wylie. Randolph Street Gallery, I Love What I'm Doing, Chicago, Jan-Feb 1995. Participants: Michael Bulka, Gary Cannone, Meg Cranston, Germaine Koh, Mary Claire McMahon, Kirsten Mosher, Susan Petzold, Juniper Tedhams. Curator: Mary Murphy, Karen Reimer & Jane Saks. Maison de la culture Frontenac, Fibres nerveuses, Montreal, QC, Dec 1994-Jan 05. Participants: Carole Baillargeon, Bill Burns, COZIC, Thoma Ewen, Anke Fuchs, Catherine Heard. Curator: Anne Marie Léger. Galerie SAW Gallery, Home, Ottawa, ON, Sep-Oct 1994. Travelling to Eastern Edge, St. John's. Participants: Ramona Ramlochand, Jennifer Ryder-Jones/David Tierney, Penny McCann, Rob Thompson, Donna James, Harold Sotomayer. Curator: Caroline Langill. La Centrale/Galerie Powerhouse, Germaine Koh / Nicole Lebel, Montreal, QC, 1994. Arts Court, March 1991 mars, Ottawa, ON, 1991. Participants: Christopher Ira McKay, Robert Fong-Jean, Antonia Lancaster, Germaine Koh. Curator: Philip Fry. Gallery 101, Another Picture I, Ottawa, ON, Fall 1990. Participants: Robert Waters, Lauralouise Legare, Germaine Koh. Curator: Daniel Sharp.